The narrow space between atheism and superstition! When being a scientific mind-body icon one has to expect two forms of enemies or critics throughout lifetime apart from personal envying individuals. The first one is skeptics. Skeptics is grounded on a sound atheistic base with concepts of eliminative materialism in science which emerged to combat the church during the age of renaissance in which it urged it’s people to believe that the disorders came either due to wrath of God or devil procession. They consider mind doesn’t exist except as neurochemicals and neurons! In other words imposing it’s followers to believe man as a mechanical machine. In order to prevent religious infiltration in science they realised that the existence of mind has to be rejected or suppressed in order to destroy the credibility of every religion. So the very emerging idea of existence of mind as separate but integrated with neurons like the idealistic neuroscience is a threat to atheistic philosophy of physicalism in neuroscience. In sum, they wanted to totally replace mind with matter. The second one is the religious fanatics and extremists in superstition. Almost all major religion wants to make you believe in superstitious demonic possession in order to explain each and every simple and complex mental phenomenon with devil possession when in fact that can be well explained with neuroscience. They madly wants you to believe in it in order to be a member of their cult and to satisfy their unscientific voids with reassurance in religion rather than science and utilize you for their personal and monetary interests with exorcism and black magic. They don’t want to explain mind-body interaction with neuroscience or psychosomatic medicine instead they want to explain everything with devils and demons! In sum, they wanted to replace and integrate the mind with demons and devils. This is my lifetime experience of witnessing a collective traumatic memories of cults with aethistic obsession and demonic obsession, who are so much distressed and disappointed with a revolutionary mainstream branch of psychosomatic medicine and epigenetics in medicine and psychology. Whoever adopts this path in advance should be mentally and emotionally prepared for the worst and dirty experiences with demonic obsessed and aethistic obsessed cults. This path is not so easy…. 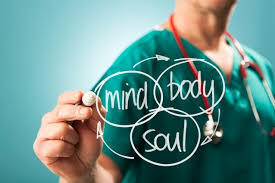 except for those who are found with curiosity and conviction with a definite purpose for the benefit of humanity to combat diseases and disorders in the mind-body continuum. Verily this is a middle path that you will not regret even beyond your grave.